Well this is the third time there has been a snow storm since I arrived in Louisiana! I am honestly starting to look forward to the hot and humid Louisiana summer (remind me of this in August, please). During the LATMC we were greeted by a flurry of snow, which thinned out the crowd as the meeting progressed. The best part was seeing snow on the levees surrounding crawfish ponds on my drive back to Baton Rouge. That certainly is a rare sight. 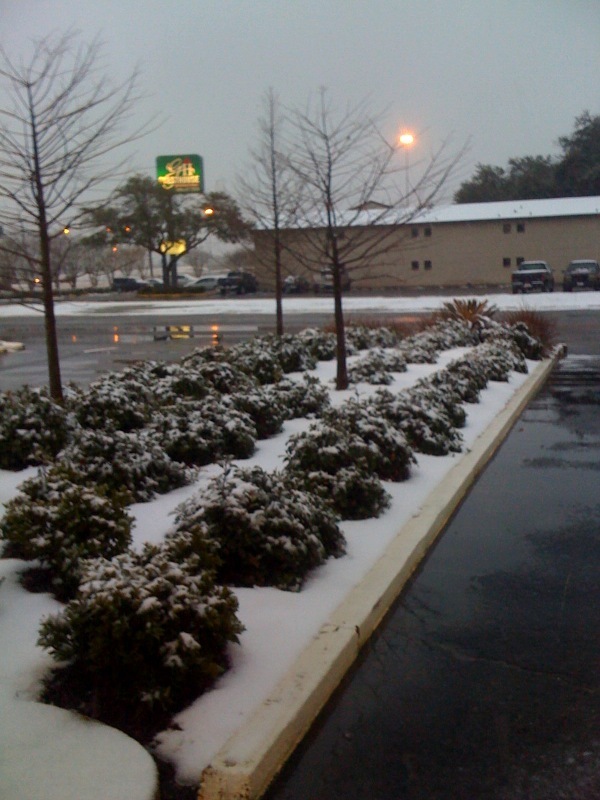 Fresh snowfall outside the SAI convention center in Alexandria, LA. The conference was well attended by consultants from across the state of Louisiana. Presentations were delivered by speakers from Louisiana, Mississippi, Arkansas, North Carolina, and Alabama. One particularly interesting talk was presented by Owen Taylor, the editor of AgFax. Owen discussed Ag Media with a focus on internet-based tools. Dramatic advances in technology were illustrated – for instance, the name of AgFax was created because the document was originally faxed. Nowadays, it is distributed by e-mail and posted on a website. The website receives over 3.5 million views annually! What a rapid change in delivery method in just 20 years. Owen discussed the need to develop mobile content for a mobile audience. Our society is on the move, and technology is now moving with people. iPhones are a great example of a computer that you can hold in your hand. Unless you are in an extremely remote location, you can always be connected to an online community. Different types of media deliveries were discussed – one being the use of video for extension programs. According to Owen, How-To videos are the best suited for Agricultural audiences. The use of blogs was also discussed, and one was highlighted in California. You might want to check it out at www.thealmonddoctor.com. One of the biggest challenges with all these new media tools is that you can easily be overwhelmed with too much information. Owen discussed some tools that can help you filter the information. One that was presented was Feedreader. You can download this software for free and use it to search multiple websites on a scheduled basis. Say you want to see what’s new on www.lsuagcenter.com or your local farm bureau page. You can program the software to check for you. This is a time-saving devise that I plan to try out. Agricultural forums are also thriving online. Owen mentioned NewAgTalk.com. This site is a Forum that you may want to explore. Forum topics range from machinery to crops to markets. Do you have any online tools that you use to in your farming or consulting operation? You can post them in the form of a comment. Well, I don’t know about you, but I am ready to get out there and celebrate Mardi Gras. Spanish town parade here I come! I hope you have a great weekend. 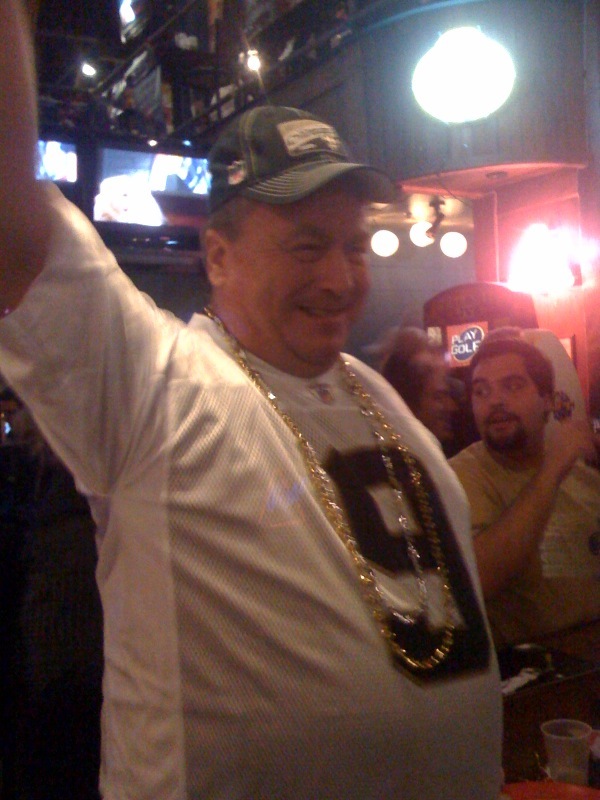 LSU AgCenter Horticulture Professor Allen Owings celebrating the Saints win! Who Dat! I am at the airport now heading back to Louisiana. Of course, I’m wearing my Who Dat! shirt and gold beads. Last night was exciting, I watched the game with Horticulture Professors from Louisiana and Texas. There was a lot of nervous pacing followed by sheer jubilation! So, now back to work… this week will be busy. On Wednesday, I’ll be heading up the LATMC in Alexandria, Louisiana. During the rice session on Friday morning there will be three Entomology presentations. Mike Stout will give a talk comparing the seed treatments Cruiser and Dermacor. Mike has many years of data studying both insecticides and will be able to shed more light on relative efficacy of both products and also the insects they control. I will be giving a presentation on Colaspis in Louisiana rice – observations from last season. Just as a refresher, you may want to watch the scouting video or study the powerpoints from the scouting training we conducted last summer. I’ve also invited Dr. Gus Lorenz (University of Arkansas Entomologist) to speak about Colaspis in Arkansas. Gus has studied colaspis for many years and he will share his experience scouting and controlling this pest. I will also speak in the general session about invasive species. This year I’ll be discussing online courses that you may want to complete. These courses were developed by the National Plant Diagnostic Network. Trainings focus on pest and disease diagnostics, how to properly prepare and submit samples, and other topics related to invasive species. It is free to complete these trainings, and you can receive a nice certificate of completion. Hope your week is off to a good start – Geaux Saints! The 3rd Annual Louisiana Crops Symptomology Symposium is right around the corner. This year the symposium will focus on cotton and rice. I’ll be giving a presentation on rice insect symptomology. Following is the information from the announcement. I hope to see many of you in Alexandria next week. One of the most difficult tasks that agricultural consultants face in their daily jobs is the diagnosis of crop disorders. In many instances, this diagnosis must be done in the absence of the casual agent such as an insect or pathogen. Identification of crop disorders is certainly not an exact science and a specific symptom may be caused by more than one plant stress. In addition, a symptom may be the result of multiple problems occurring at the same time. To assist LACA consultants, county agents, and general IPM practitioners with the diagnosis of crop disorders, a 4-hour workshop has been scheduled just prior to the 2010 LATMC. This workshop will focus on the symptomology of rice and cotton disorders. Other Louisiana crops will be included at future LATMC meetings. To provide training on the visual symptoms associated with a variety of crop disorders, a series of slides will be presented by a team of LSU AgCenter scientists who will discuss the visual symptoms important in identifying selected crop disorders. The goal is to provide an inter-disciplinary examination of crop symptomology resulting from pathogens, arthropods, nutrient deficiencies/toxicity, herbicide injury, and environmental effects. This workshop is not designed to include symptoms of every possible crop disorder, but to provide a simple overview of the most common problems. If successful, each crop group would be re-examined on a three year cycle to include more information on specific crop symptomology. Each new participant will be provided a bound hard copy of the slides that will be used in the workshop. Those who participated in 2008 and/or 2009 should bring their own binders and just add in the 2010 hand-outs. This will save an additional $10.00 on the registration fee (fee will be $60.00 if another binder is provided). However, there will be no written information included with the slides and illustrations. Those individuals participating in the workshop will have the opportunity to record their own notes from the comments provided by the speakers. Pre-registration is required. To register, indicate attendance on the LATMC registration form and submit registration fee of $50.00 prior to January 30, 2010. This workshop is separate from the LATMC and will not be considered mandatory for agricultural consultant and commercial pesticide applicator recertification. For more information, contact Roger Leonard, rleonard@agcenter.lsu.edu or Denise Wright, glpblues@bellsouth.net.